Gaming has always been the forefront of the iOS & Android ecosystem and developers have churned out the most detailed games in the recent past, giving casual games on consoles a run-for-their-money. Here we have with us a great casual game offering Let’s Golf! 3, belonging to the popular Lets Golf franchisee. Developed by Gameloft, this developer has proved to be a pioneer in smartphone gaming by churning out some of the most detailed games the smartphone market has ever witnessed or thought it would witness. Having titles such as, Assassins Creed, Tom Clancy Splinter Cell, Backstab and the likes, Let’s Golf! 3 lives up to the quality of the Gameloft product line-up. The game update brings in a new course that is now located in Japan. Moreover, the game continues the legacy that has been established by the past two Let’s Golf! games. In this version, the game ups the entire graphical representation and makes everything look more vivid, crisp, and lively on the display. A serious boon for users on smartphones with HD display. Now the terrain varies from waterfalls, lush forest and distant green, making everything a treat to the eyes. What really takes the game to the next level is the gameplay. Not only is it smooth and stutter-free, it also provides the player with an immensely intuitive experience on the whole. Players of the previous games will easily realize this. The game also features the Multiplayer mode, by allowing up to 4 players to compete against each other, either Online (Only Wi-Fi) or locally (Bluetooth). By popular demand, Gameloft has added the support of multiplayer play on the same device. 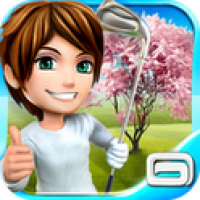 The game is loaded with goodies and players can easily create their own golfer with various looks and options. The more impatient ones can purchase special skills via the coins earned in-game. Let’s Golf! 3 features a host of mini-games to break the monotony experienced by the impatient lot of gamers. Overall, Let’s Golf! 3 is one great game which will keep players hooked for a very long time. The graphics, User-Interface, sound, display, gameplay and everything is simply amazing to say the least. Being offered for free, Gameloft has just nailed the coffin in the sweetest spot available. The game being available on both iOS & Android will help it to create a larger market.